Where enabling works become complicated by the presence of unforeseen problems such as asbestos in soils, unexpected contamination or substantial underground structures, a client’s conventional demolition or groundwork contractor will often respond by applying significant fee increases to cover their perceived risk. However, to Celtic these ‘risks’ are little more than our core activity of managing our clients programmes on brownfield redevelopment sites. This is something we have done, on more than 1600 sites, since our formation in 1992. Where the less experienced contractor will see risk and uncertainty, Celtic are able to provide cost and programme confidence. This has never been more clearly shown than in a project now coming to an end for a major developer in the southeast. Previous advice from their preferred supplier had identified a significant cost associated with the need to address residual asbestos in soil, and a delay to programme as the works would, it was claimed, require the involvement of a licensed asbestos contractor, thus preventing the groundworks from commencing. 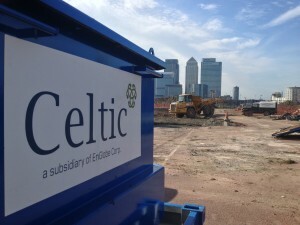 Celtic were called in to provide a second opinion and quickly identified that not only did the works not require a licensed asbestos contractor but that also, provided a suitable safe system of work was put in place, the groundworks would be able to continue, maintaining the development programme. Celtic was able to draw on both its experience as a site remediation contractor, and knowledge of the off-site waste industry, through its sister company Biogenie, to provide confidence to the client and to reduce the project costs by an estimated 60%.